Explore Life Lah! : Is central Bangkok flooded huh? While everybody is asking whether it is safe to visit Bangkok in the wake of the kingdom's most crippling flood in 50 years, I decided to go see for myself. And I'm happy to report, everything is as per normal in central Bangkok! View from Mo Chit BTS Station looking out to the city skyline framed by the roof of a multi-storey carpark. It's business as usual in Bangkok. In the weeks leading up to my trip, I watched the news very closely and was worried over how many pairs of swimming trunks to bring. And also the health risks following severe inundation. I was expecting chaos. But instead, nothing has changed except for visibly fewer tourists and tons of sand bags. My flights there and back were largely unoccupied and the streets seem quieter. 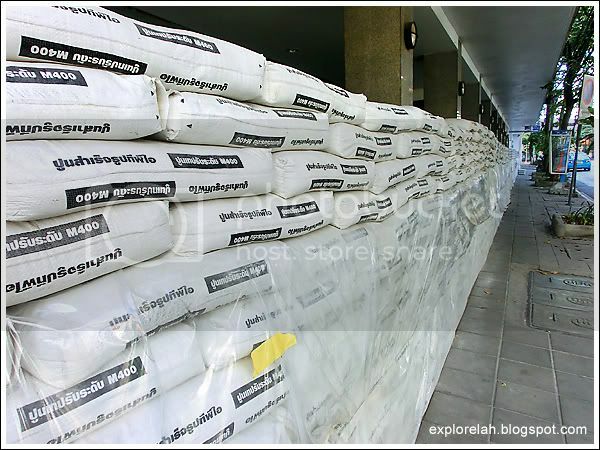 Many shop fronts were lined with sandbags in a better-safe-than-sorry bid against potential flooding. 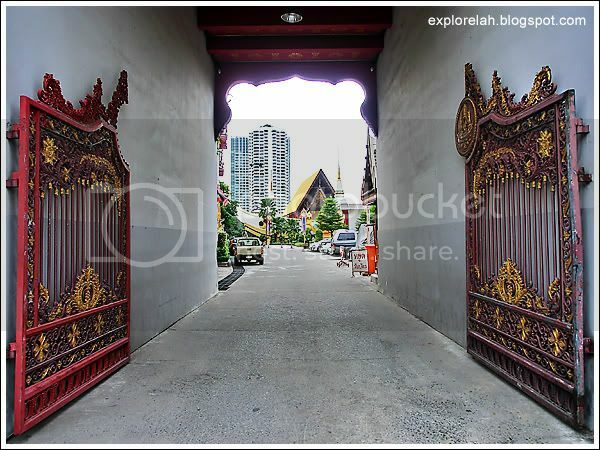 I had wanted to plan some self-exploratory sightseeing tours but faced with the uncertainty in weather and flood situation, I decided to stay put in central Bangkok and explore the streets instead. 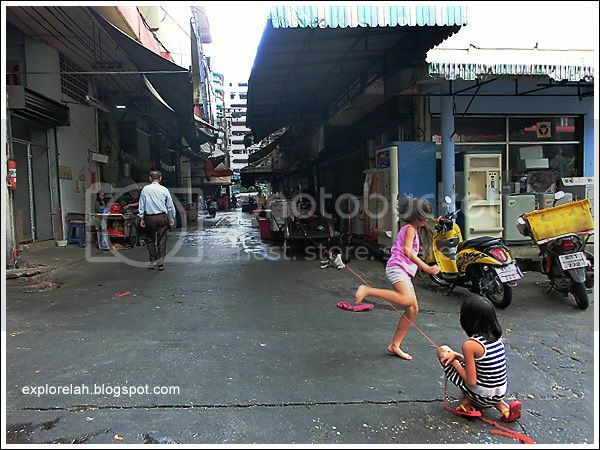 So armed with the Casio Exilim ZR100, I ventured into backlanes and roads unfamiliar to feel a pulse of Bangkok off the usual touristy track. 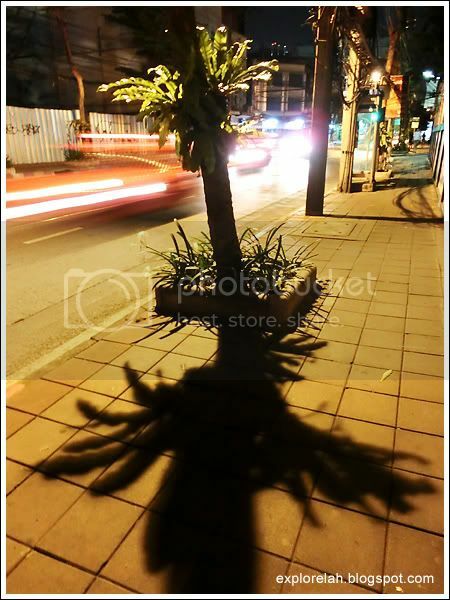 This post is a conglomerate of Bangkok streetscapes and musings captured during the explorations from the day I touched down to the night before I left. 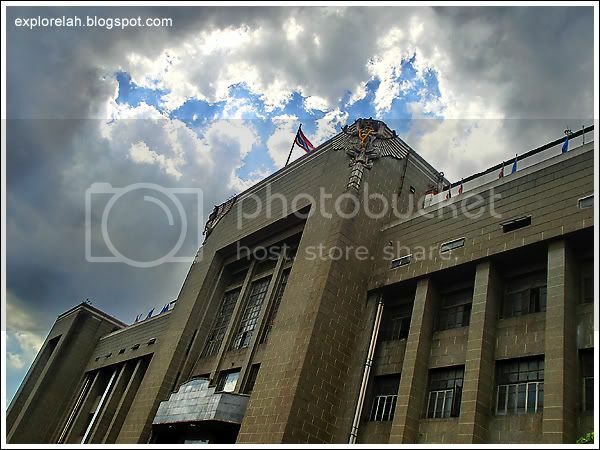 I hope you'll enjoy this series of images and travel anecdotes. 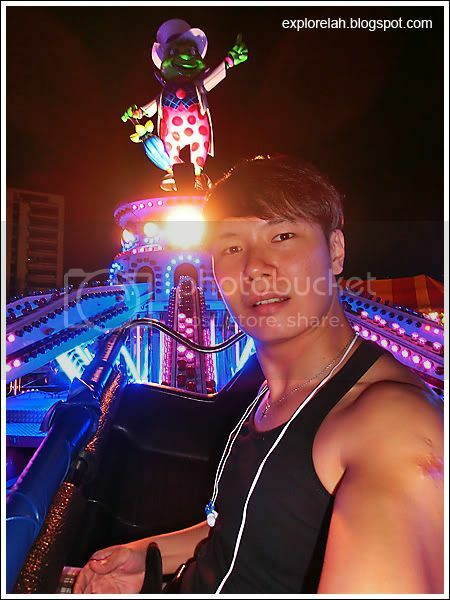 The photos are not arranged in any particular manner but I try to group them according to location, themes (eg. 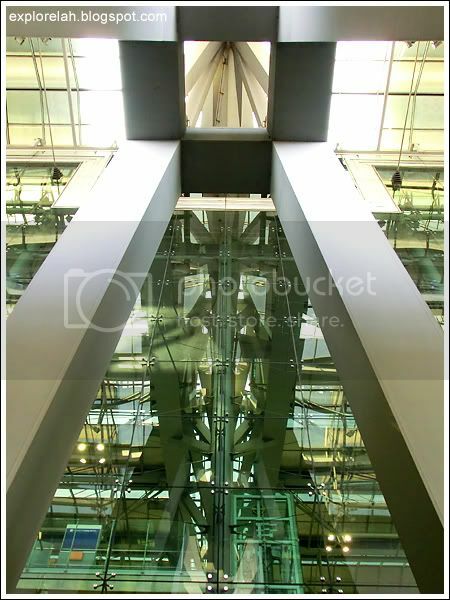 architecture, street photography) or subject matter (eg. animals, plants, food) to string together a story of my encounters. Most of the shots were taken at and around Bang Rak distirct where I stayed during the trip, and some new perspectives of old places I'm seeing for the first time. Exterior of Suvarnabhumi Airport. I've not seen this perspective although I've passed through the airport several times. I think it is one of the world's most beautiful modern airports. 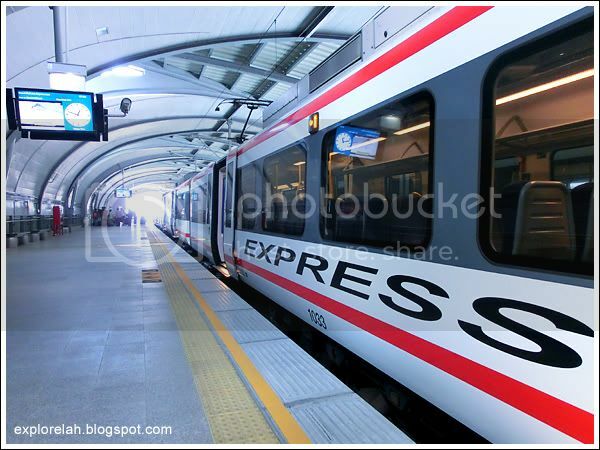 Cheapest, and perhaps the fastest way to get from Suvarnabhumi Airport to the city center is by the Airport Rail Link (Express). It costs 90bht one way and takes about 15 minutes. Frozen in flight is an assembly of white birds within a small park outside the airport. 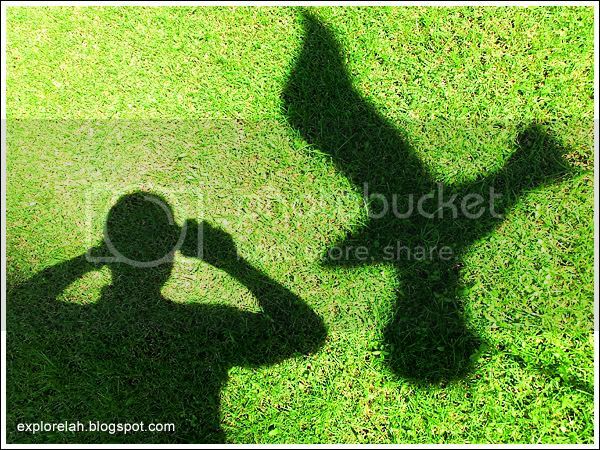 This photo of the 2 shadows symbolises the freedom to fly and explore the world with EX-ZR100. The arches formed by my arms represent wings of a bird. One the worst hit during the flood was the auto manufacturing industry with hundreds of new cars submerged and factories damaged. 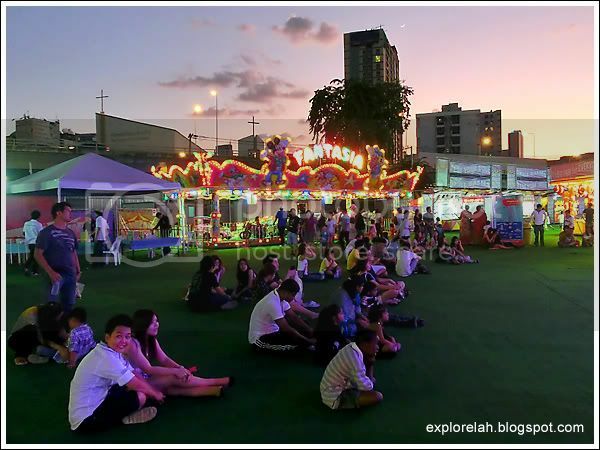 Central Bangkok gets the tourism green light. 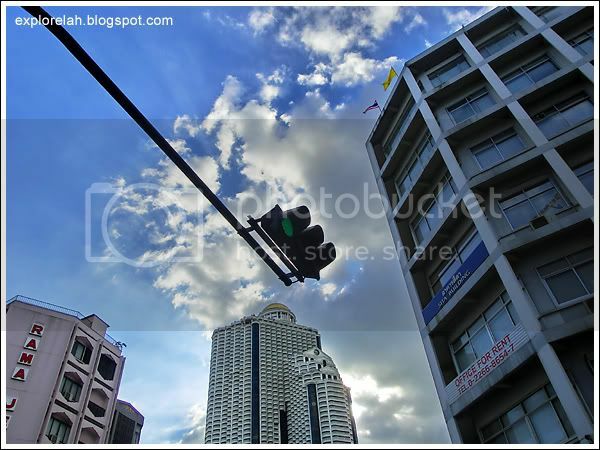 In the middle is the majestic Bangkok State Tower. 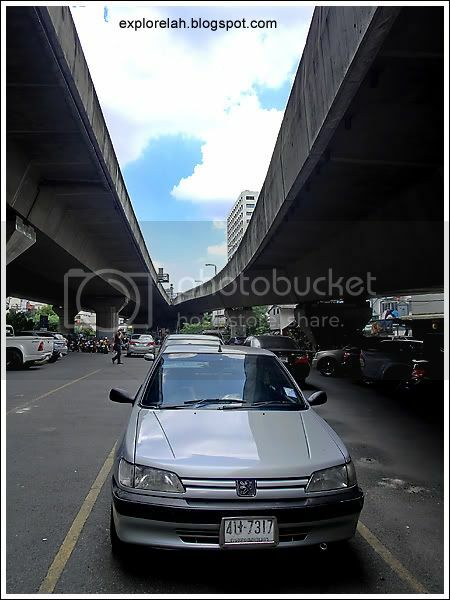 The streetscape of Bangkok is an odd mix of tired vacant buildings juxtaposed with up-class complexes. Very interestingly patterned building visages found along Surasak Road. 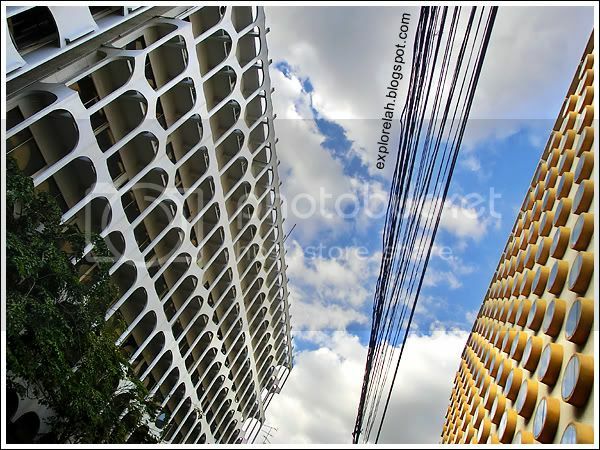 The yellow one with the disc-shaped windows belonged to Holiday Inn Bangkok. So groovy and retro! 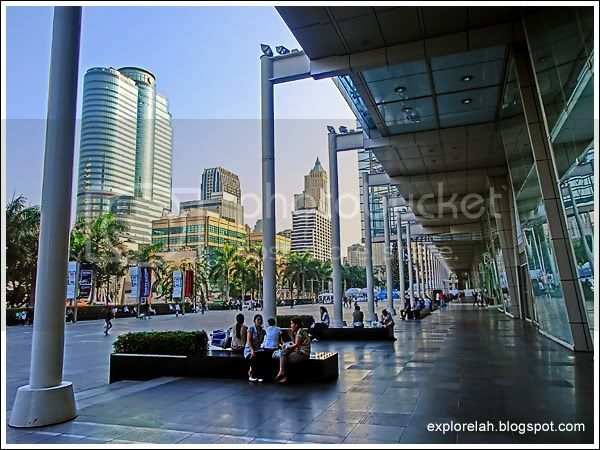 The ultra chic CentralWorld Shopping Mall which was previously the World Trade Center. It was set on fire last year by the Red Shirts during an anti-government protest. Good to see that it has been reinstated. Thai Red Cross charter in Bangkok. Came to do a HIV blood test after reading about it online. Test result : Negative. Will post more about it in a dedicated blog entry about the experience. 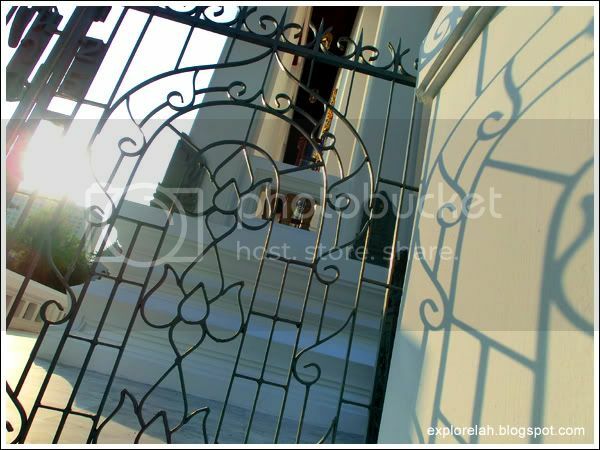 Thailand is famous for her many extravagantly decorated wats that shout of architectural flambouyance. 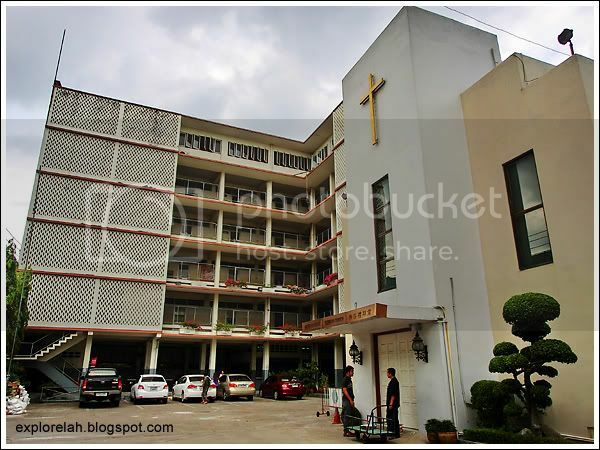 So it was quite a break to come across the understated, old-school Sathorn Church. Wandered into a backstreet market near Bangkok's Shangri-La Hotel. The girls were missing 1 more player. I would've joined in, but I didn't want to come back to Singapore horizontally. [Bridge Roof]. 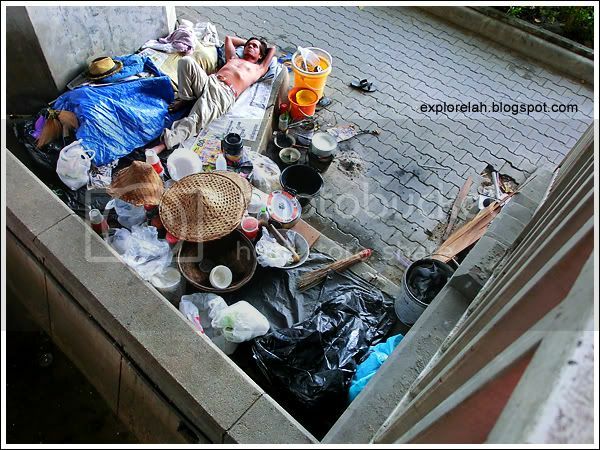 This man turned a corner under a bridge into his home. I wonder what was he thinking about lying there, oblivious to me taking his photos. [Bridge Woof]. 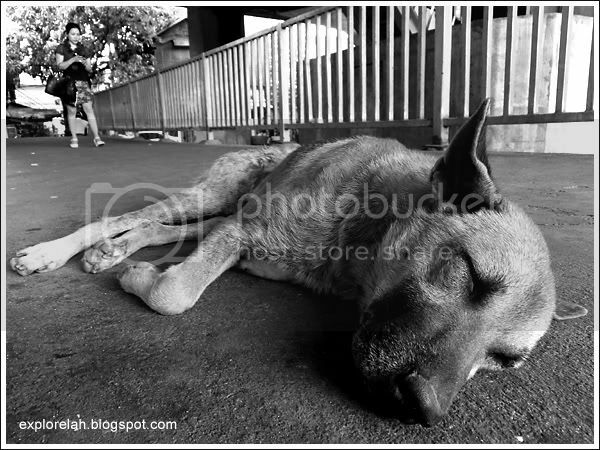 On the pedestrian bridge where the photo of the vagrant was taken was this dog taking a nap. Angry birds! The red-eyed pigeons look so fierce. 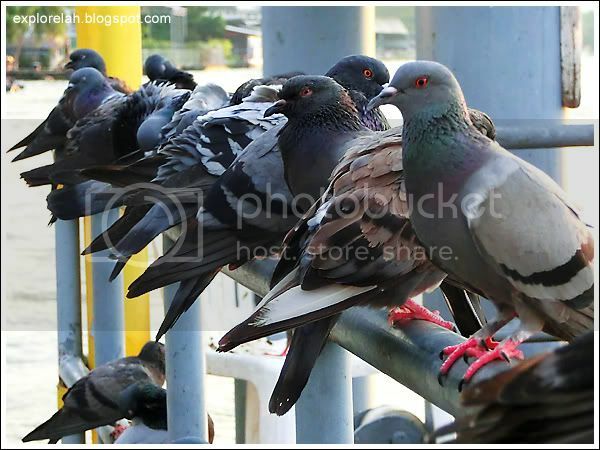 Shot with the one-touch High Speed (HS) function as the pigeons were very fidgety and it was hard to get them in focus with normal mode. Don't know the name of this wat near Saphan Taksin BTS Station but it leads to a floating platform on Chao Phraya River. A pretty good spot for sunset over the river shots. Wat you sweeping? 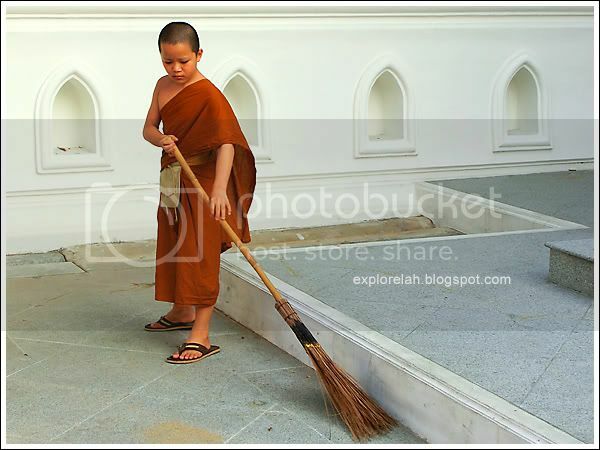 Sweeping nothing is clearing something, and sweeping something is clearing nothing. Okay, that's a weak attempt at exemplifying the 色即是空，空即是色 Buddhist mantra. This temple, again don't know its name, is near Siam BTS Station. Catching shadow and light with HDR mode. 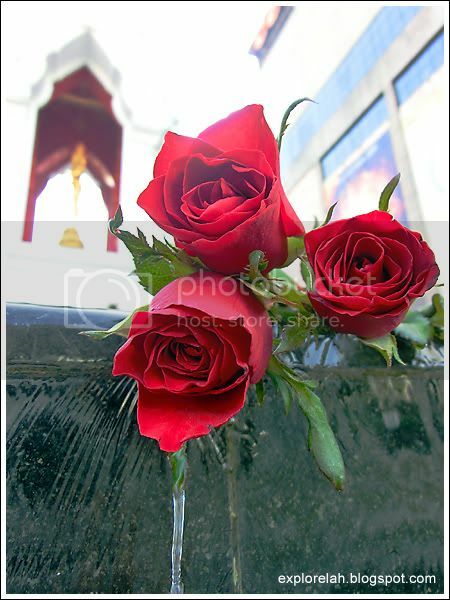 Spotted these roses left by devotees for the four-faced Buddha statue in front of CentralWorld Shopping Mall and loved how the water was trailing from one of them. Shot in HDR mode as the roses were very dark when contrasted with the sky at this low angle. 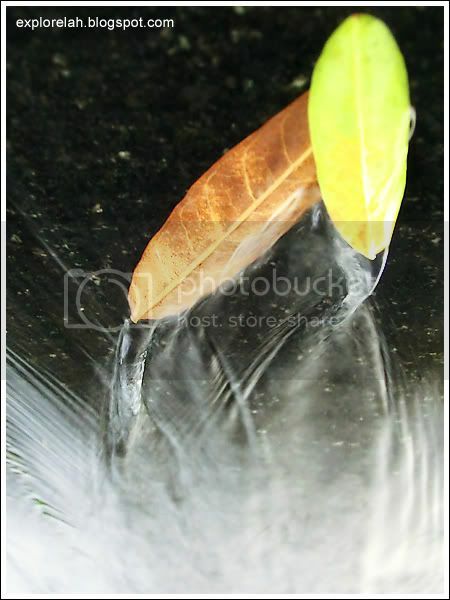 Attempt at creating an abstract shot with water flowing over 2 leaves stuck on the wall. Shot in High Speed (HS) mode to achieve sharpness of the rapid current. 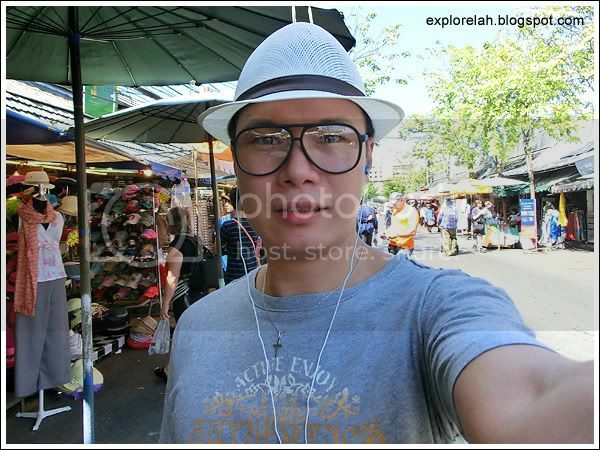 Goofying it up with a pair of vanity frames at the famous Jatuchak Weekend Market. Relaxing over a cuppa at the destination for wholesale bargains, Platinum Mall. 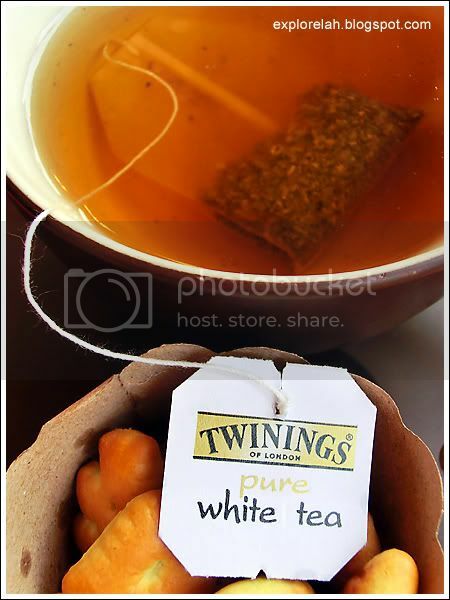 I was having this white tea at Black Canyon Coffee. White-black, tea-coffee... it's an afternoon of polarity. 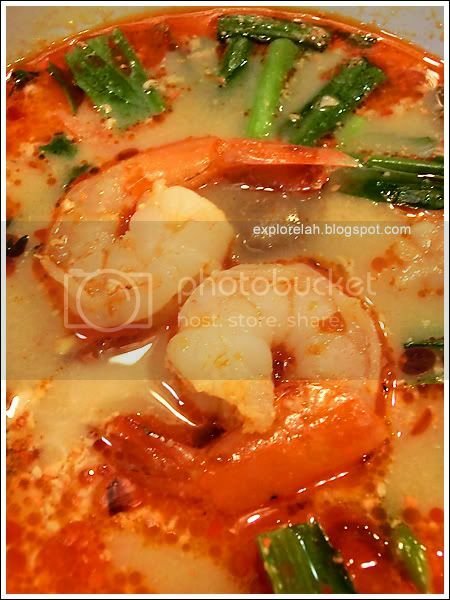 Tom yum kung... My fave Thai soup. I have a bowl on a daily basis whenever I visit Thailand. A-roy khrup! Another of my favourite while in Thailand. I'll hunt down roadside stalls that sell these delicious snacks. 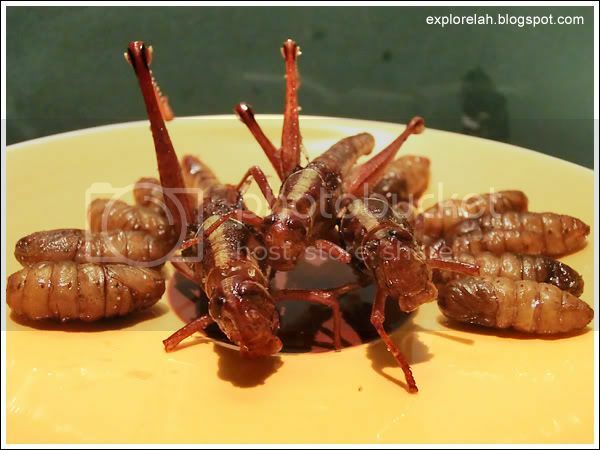 Unfortunately, they aren't readily available and usually it's a matter of luck to chance upon an insect street seller. I've yet to come across one that sells scorpions. Let's play a game of Where's Wally. But try and spot the cam whore in this photo instead. Saw that person? Shot in Premium Auto mode with -1EV (exposure value) to underexpose the sky so that the mild sunset colours can appear richer. However, the evening hues still looked rather distreet. I should've tried -2EV. 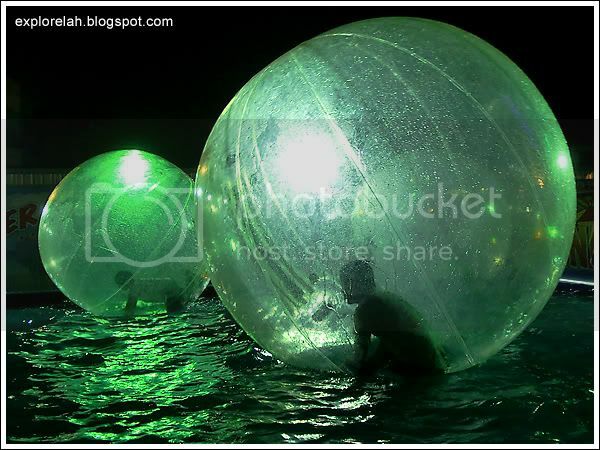 Walking on water is no longer a miracle with these floatation spheres at the Sam Yan Fun Fair! Used to love thrill rides but as I got older, they kinda frighten me. From the ground, the City Hopper ride looked rather mild, but oh, how wrong I was! This amusement contraption is the kind that makes you change your underwear after riding it. Time always seem to zoom pass so quickly when in Bangkok. So many things to do, so much to shoot. The impression of each visit always leave a memory longer and larger than the actual encounters themselves. Shot in Manual mode (f/3.0, 0.3 sec, ISO 800). I was surprised the photo turned out pretty sharp enough though the exposure time was long and it's a handheld shot. There's always a tinge of sadness when it comes time to depart from Bangkok but these images will remind me of the delightful discoveries I made during this trip. 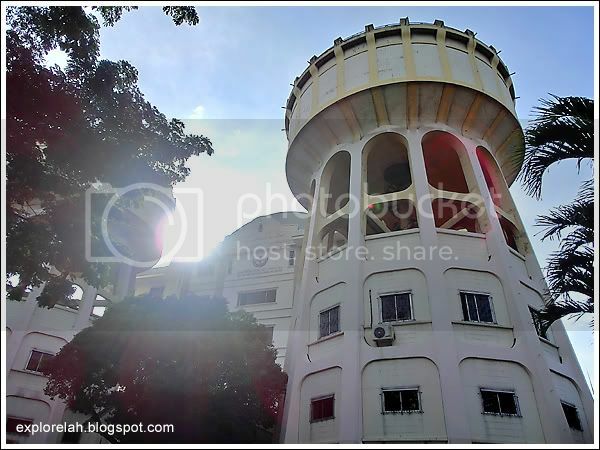 All photos in this post have been shot with Casio Exilim ZR100 with basic Photoshop post processing done. The photos show how the camera performs in a variety of situations and imaging needs with wonderful results. Can't wait to shoot my next destination with it! For more photos taken with the camera, please visit my album A Month with Casio Exilim ZR100.